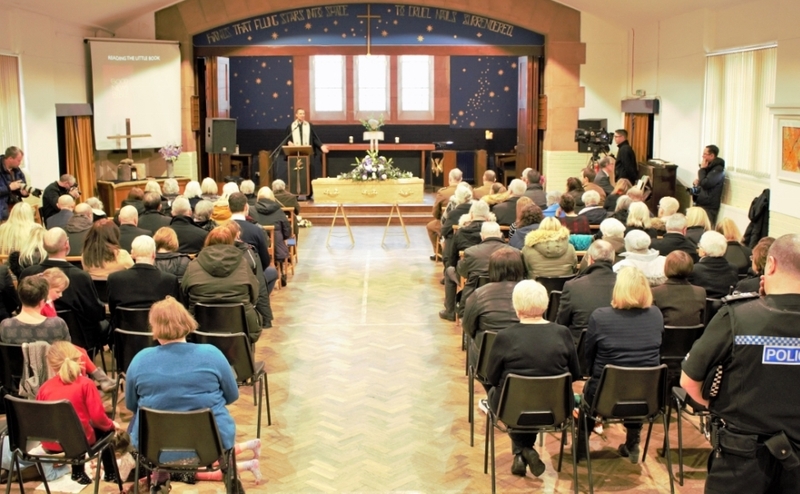 A North Glasgow church brought its local community together to give a big send off to one of its longtime members who has died at the age of 103 after outliving her husband and her entire family. Born in Possilpark in April 1914, Annie Minto Wallace was known for her lifelong love of singing and her wealth of stories. A lifelong church member and keen chorister, she was beloved by the congregation and by her carers in Ashgill Nursing home. She died on 23 December 2017 at the age of 103. 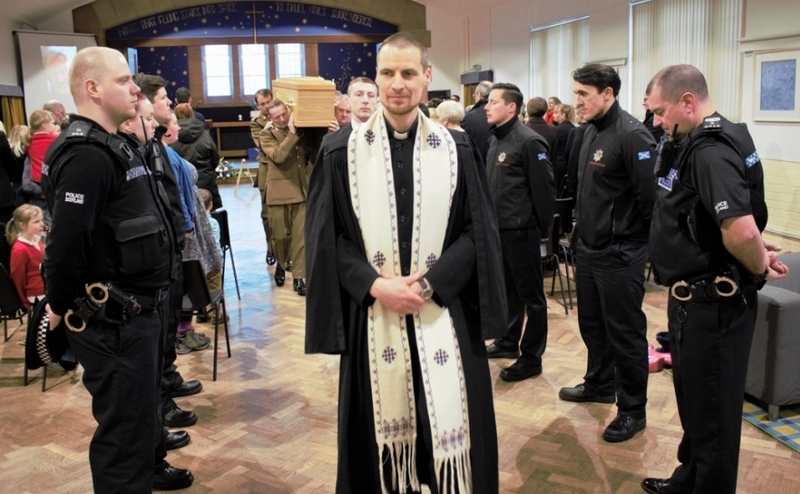 Rev Christopher Rowe, minister at Colston Milton Parish Church and chaplain to 32nd Signal Regiment, arranged for members of the regiment to carry Mrs Wallace’s coffin at the service to celebrate her life, held at 1pm on 18 January at the church. More than 100 mourners joined members of the Colston Milton congregation at the service to celebrate her life including servicemen from the 32nd Signal Regiment, local council members, firefighters and police officers. Mrs Wallace, who lived in the Possilpark area her entire life, lost her father at an early age soon after he served in France during WW1 with the15th Tramway Battalion of the Highlight Light Infantry. She was widowed some 40 years ago and also outlived her brother and her niece. “Annie lived through two World Wars and has survived all of her family,” Rev Christopher Rowe said. “But she was very well loved, always cheerful and had the most marvellous stories to tell. I’m very pleased that I will be able to tell some of those stories one more time as we celebrate her life. “Annie has always loved singing and I can say with confidence that she was still singing the day that she died, and I rather suspect there was not a day in the last 100 years when she didn't sing,” he added. “Last year, I asked her for her favourite carol, and she said she had no favourite but liked ‘Away in a Manger’, which she sang with us. Rev Christopher Rowe, minister at Colston Milton Parish Church wrote and delivered the following eulogy on Thursday 18 January 2018. Annie Wallace was born the 20th April 1914. Annie Minto as she was named was the only daughter to Mary and James Minto, though she had a brother John. Annie said her dad was born in March, she was born in April, her mum in June -a season of birthdays. By the time wee Annie was 4 months old the First World War had begun, and her father James, who was a tram driver had volunteered for the army. He joined the 15th Tramway Battalion of the Highlight Light Infantry, one of the so called Pals Battalions, where men who lived and worked together joined up and served together. The Battalion was raised on 2nd September, in 16 hours. The manager of the tramways department phoned round his depots asking if any of the men were interested in volunteering in a battalion drawn from the cars, 16 hours later he had a list of 1100 volunteers. The Battalion served in France, taking part in the Battle of the Somme. Annie's father was away for the duration of the War, but unlike so many he did return, 'though he was to die when Annie was still young and she never really knew her father. Her mother in contrast lived into her 90s, and Annie looked after her when she herself was nearly 70. Annie was born in Possilpark, growing up at 113 Allander Street and attending Possilpark Public Primary School on Allander Street. Her grandparents ran a pub called the Cosy Corner on the corner of Keppochill Road and Saracen Street, and lived above the pub, opposite what is now See Woo. She said she used to play in a box of sawdust in the corner as they did the glasses. Annie was born into a different world from today in many ways. Glasgow was the second city of an Empire on which the sun never set. The shipyards of the Clyde were the single biggest producer of ships in the world, and the locomotive yards at Cowlairs and the Caledonian produced railway engines which served across the world. The north of the city, where Annie grew up would have been unrecognisable to us today, with the Saracen Foundry and brickworks dominating Possil. Annie herself always worked doing shopwork. I remember Annie talking of working at Lambhill Dairy, and also at a RS McColls on Sauchiehall Street. She said how once she was in the dairy and a certain lady walked in with a spring in her step and a smile on her face -such that Annie noticed her change of demeanor. Annie then told me how that was the last time that particular lady was seen, because that same day she eloped with the priest from St Agnes Chapel -she assumed that was why she was in such a good mood! As you can imagine Annie recounted the story with a smile and a twinkle in her eye, and certainly no disapproval. I assume Annie had always been involved in church, she certainly had been a member for 37 years at the old Henry Drummond Church on Allander Street and Barloch Street which united in 1967 to form Trinity Possil and Henry Drummond, before coming to Colston Milton. But I don't ever think of Annie as a grim Presbyterian – she always had far too much fun about her. The church perhaps gave her an avenue for her love of singing. She sometimes regretted that she had never properly learned to sing, or trained her voice -but it was so beautiful, such training may have ruined her. She told me how she was singing in the church choir, and the choir master was telling them to roll their “rrrr's”, she laughed out loud as she said, 'I thought he said roll your arse', and she duly obliged! Now I don't know if that was Donnie Mathieson, who has joined us again today, and who has given us some of his memories of Annie. Annie has always loved singing and I can say with confidence that she was still singing the day that she died, and I rather suspect there was not a day in the last 100 years when she didn't sing. I had been up to visit her on Saturday 23rd December, at about 11 in the morning, and we sang the first verse of Jesus loves me. Her memory of the words from familiar songs and hymns was amazing, she never needed a book. Her favourite was Blessed Assurance -with its wonderful chorus, 'this is my story, this is my song, praising my saviour all the day long.' She certainly lived that chorus. She used to sing duets with Mrs Crystal at Colston Milton, who I believe also lived to a hundred. So singing must be good for you. Donnie Mathieson, who was for many years the organist and choir master here in Milton said this was quite a comical relationship, as Mrs Chrystal was a bit “prickly” and could take offence if not given her due place. This was in contrast to Annie, who would always say to Donnie “put me near the end of the programme”, so she could get focused. These two ladies sang well together. Old gospel favourites “Stranger of Galilee” and “Whispering Hope” etc. Donnie said this, 'I first met Anne Minto Wallace almost 41 years ago when I was appointed Organist at Colston Milton In August 1977.I had first met Anne back in June 1977 when I “filled in” for holiday supply. First of all I should say I rarely caller her by her first name, until latter years, but rather/always addressed her as Mrs Wallace. I don’t know if it was a “Milton” thing, but the choir addressed each other as Mr this, and Miss/Mrs that. Over the 9 years I was Organist we got on well. Anne was a super chorister, with a wonderful voice, a sensitive ear, and a natural musical sense. She did not read music, but used the “Curwens Tonic Sol-fa” which even in my day was widely used in schools. One memory I have of Annie was in the early 80’s when I asked her to sing solo “Sleep, Holy Child” from John Petersons, Night of Miracles. Now anyone who knew Anne would know she was quite conservative musically, and this piece written in 1959, very contemporary back in 1980. But Annie fell in love with the music, and sent me a note thanking me for allowing her to sing this piece. I knew then I had “cracked it” and our relationship got stronger, so much so that shortly after I got married we invited the choir to our home for supper and found Annie had a sense of humour and could see things funny that others could not. Annie up to a few years ago always remembered my Birthday, even though I had been away from Milton for over 25 years. This came about because I share my birthday with Queen Elizabeth II. Annie was born the day before on April 20th, the Birthday of Adolph Hitler which she often joked about. Annie has always lived in the north of the city, Possilpark, Dundasvale Court at Cowcaddens and then 74 Egilsay Street in Milton and later Taransay Court and finally Ashgill Nursing home in Milton. Her niece Pearl Anne had a son Simon, who was going to the High School of Glasgow, but said that they were all snobs, saying my aunt goes here, and my aunt goes there. Annie said to him, tell them that your great aunt lives up north, by Raasay, opposite Mingulay -but just don't say the word street. She always talked fondly of Pearl and her nephew Simon. Sadly Simon died quite a few years ago at the young age of 42, and Pearl, though much much younger than Annie died a few years ago now. Annie had a brother John, who joined the Cameronians (The Scottish Rifles) during the Second World War, and was billeted at Gordon Barracks in Aberdeen for part of the war at least. Annie told me how once he was on the heather with the Royal Family when they were on holiday at Balmoral, either as protection or beaters, I'm not sure. But Annie told how her brother John was looking for some white heather -the King, George VI asked him what he was doing and he replied that he was looking for white heather to send to his mother. Seemingly the King found some first, and gave it to John and said to send it to his mother with his regards. Sadly after the war John became an alcoholic and ended up on the streets. Annie would get very emotional when she spoke of him, and when she was younger and about the city centre, she would keep an eye out for him looking for him among the homeless and on street corners. At some point Annie met and married William Wallace -when I asked her she couldn't remember when exactly, but she said they were past the teenage romantic years. They married in later life, and they never had children, and sadly William died in the early years of their marriage. She said she had a cousin Mary down in England somewhere, but Annie has no family left – other than you who are here and the many folks who have helped look after her, especially in her later years. She was always hugely appreciative of the 'girls' who looked after her. She would always say that she was well looked after, and she has been blessed with good friends -not least many from church, Elma Wheatley being one of them who was always rather embarassed to be described as the one who looked after Annie's finances! and what will the robin do then, poor thing. and tuck his head under his wing, poor thing. First meeting her when she was already 94, she always reminded me of a little bird. Her stock response when I would visit and ask her how she was, was that she was still hinging the gither, before telling you how well looked after she was by the girls. She never seemed to get down, but always to have a cheerful response, and she would always thank me for my visit, and be sure to give my regards to all my friends at Colston Milton. She was always telling wee stories or anecdotes, at one of her very rare stays in hospital, perhaps even her only one, she had been admitted to Glasgow Royal, and she told me how a certain American actress had been admitted to the Glasgow Royal and commented favourably that she never received such good care as she did at the Glasgow Royal Infirmary. I don't think Annie had visited the doctor for the first 98 years of her life, and I think when she was 98 she still did some of the walk with the cross on Good Friday, when members from the 3 churches in Milton would walk carrying a large wooden cross. At 98 Annie walked from St Augustines to St Andrews before going home to Taransay Court. I think in Easter 2010 she had still managed the whole walk, at the age of 96 -accompanied by Bernie the manager at Taransay Court. Annie would always make Bernie promise that she would never send her away from her flat at Taransay Court, and it wasn't until it became clear that Annie needed nursing care beyond the visits of her home care team from Cordia that she moved to Ashgill nursing home. Annie has been well loved and looked after wherever she has lived, and Ashgill was no expection. Many of her visitors would sing with her, and so would the staff. Zola, one of the nurses from South Africa would sing to Annie in her native Xhosa -Jesus loves me, while Annie would sing in English. For the last five years some of us have gone carol singing round Milton, and we'd always visit Annie, either at her flat in Taransay Court, or laterly in Ashgill Nursing Home. Last year when we went to sing for her, I asked her for her favourite carol, and she said she had not favourites but liked Away in a Manger, which she sang with us. 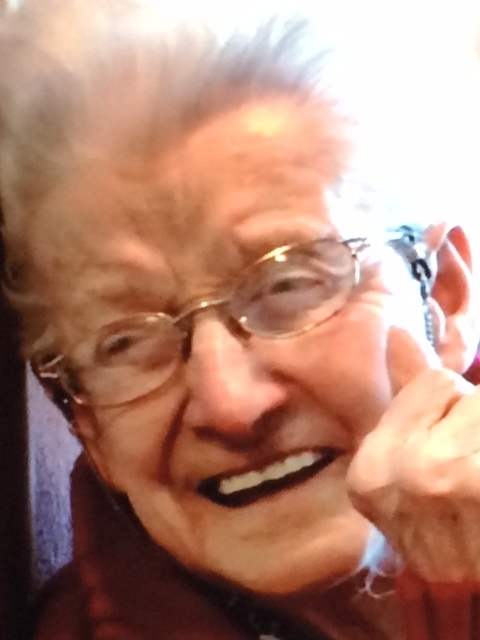 I said she was amazing, that she was 102. She was, a very precious antique. I visited Annie on 18th December, and sang Blessed Assurance and a couple of carols with her and said a wee prayer and then on Friday 22nd Zola phoned to say Annie was running a bit of a temperature, so I went up the next morning about 11am. She was actually quite bright and knew who I was -sometimes I think she was a bit confused as to who I was, though always glad for the visit. We sang Jesus Loves me this I know, and had a brief chat and I said a prayer -which included the words, let your servant now depart in peace. I said good bye and said I brought the love from all our family, and the folks at church and Annie said as she always did, and please give my regards to all my friends at Colston Milton. She seemed on really good form, bright and cheerful. At 15:30 I received a phone call from Zola to say that Annie had just died. I cycled up to see her and she was still warm when I went to visit, her skin so soft as I took her hand. I'd long thought how for the last few years, life and death for Annie was probably the difference of a few hours of being awake. Just a small difference, almost crossing between between being fully alive in this world and fully alive in the next. Annie was 103 years old when she died, and I have no doubt that she is in heaven – forever young, forever her beautiful gentle, fun and positive character, and we are all the better for having known her. 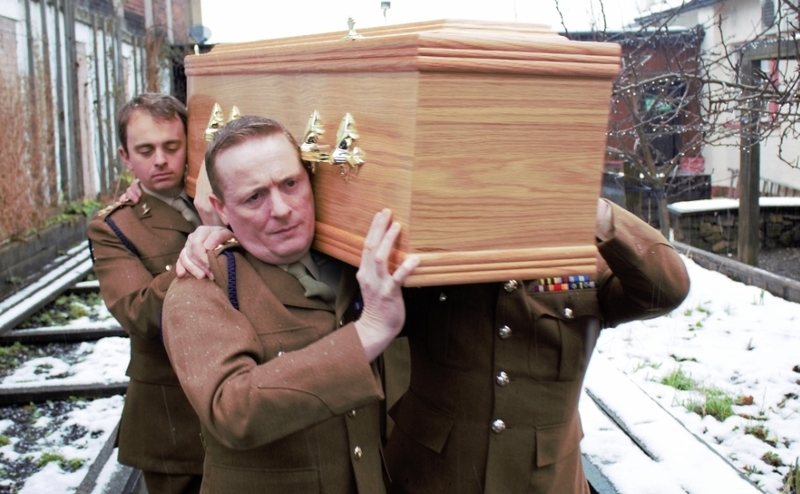 Servicemen from the 32nd Signal Regiment carried Mrs Wallace's coffin to her final resting place.